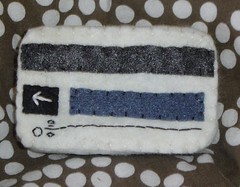 I am in the middle of a major update to my etsy shop in preparation for my debut in the etsy showcase tomorrow. *edit: I am an idiot. My Showcase dates don’t start until Friday* If you would like to be informed of updates to my shop and be privy to special offers, sign up for my mailing list. 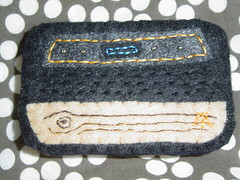 The big ticket item in my shop right now is my Atari 2600 themed altoid tin. I am wickedly proud of it. The price is steep, but there was just too much hand stitching in there…. 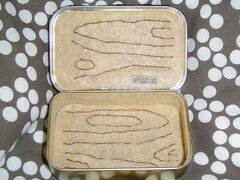 There is also a tin just for SF Bay area commuters. see anything you like? If you buy anything leave a comment saying you are one of my blog readers and I will throw in something special for you. 2 Responses to "Major shop update"
Your roving’s so pretty! I’d have a hard time letting go of it, too! 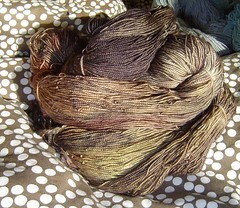 The Forest Pixies on your etsy shop looks a lot like some dyeing I did recently. wow! atari…of course my family was dorky enough to only have an odessey 2. 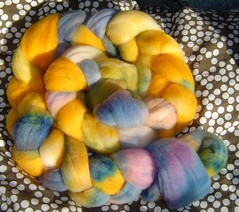 The shop update looks great – I LOVE the patina yarn…very cool colors.